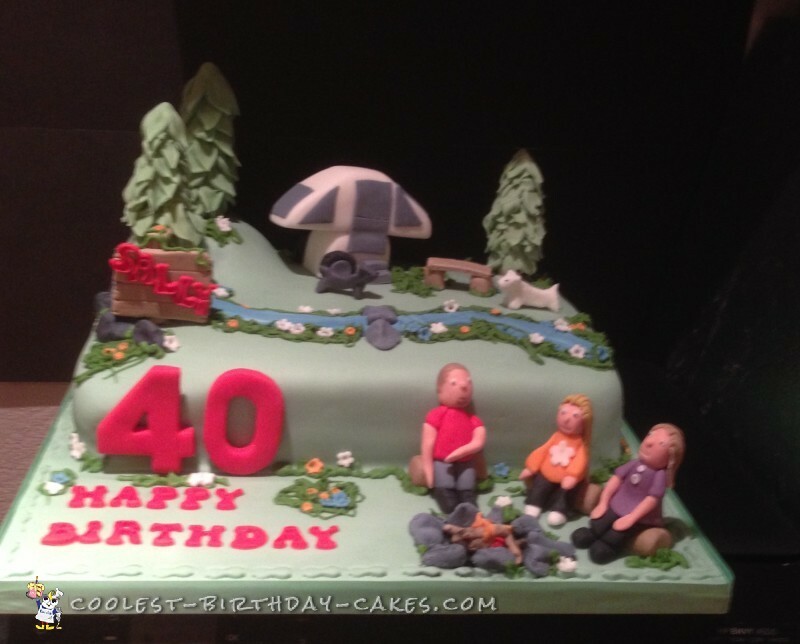 I made this camping cake for my 40 year old niece. 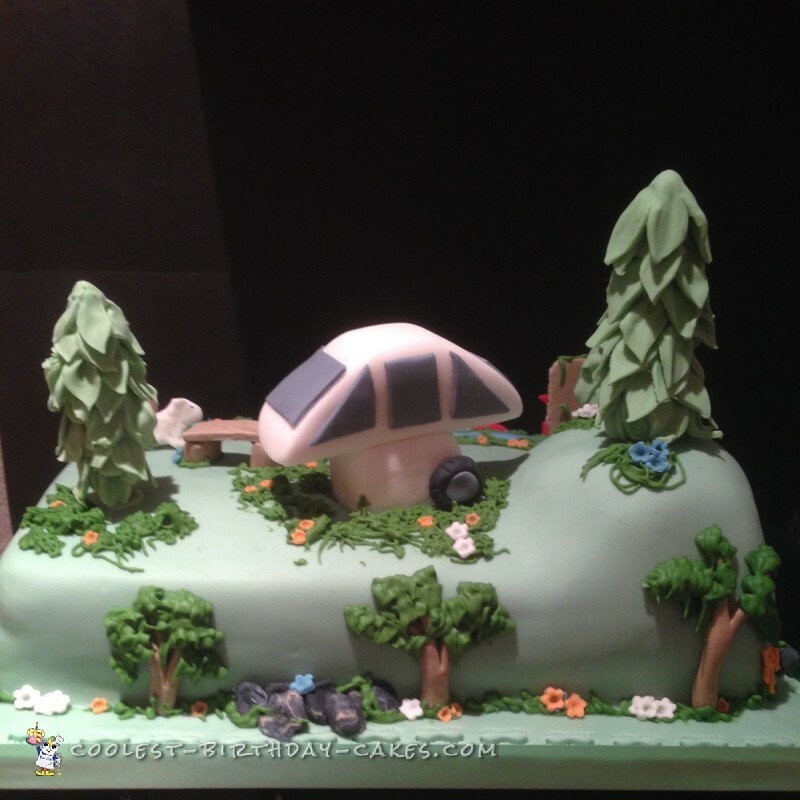 I shaped the caravan out of white modeling paste, then added the windows and the door from gray fondant. Using black modeling paste, I made two tires, attached them to the caravan and then set it aside to dry. Next I made the trees. First, I made three cones in different sizes out of modeling paste. I stuck a dowel into the center of each cone and then attached tree trunks. I let the trees harden overnight and then attached leaves the next day. Using green modeling paste I cut out large daisies, trimmed of each petal and flattened them out. I then attached them to the domes one by one, starting at the bottom until I reached the top. I rolled out a billboard, a bench and three logs, so that my people had somewhere to sit. I modeled the people sitting on the logs and then set them aside to harden. I sculpted the dogs and cut out some flowers. 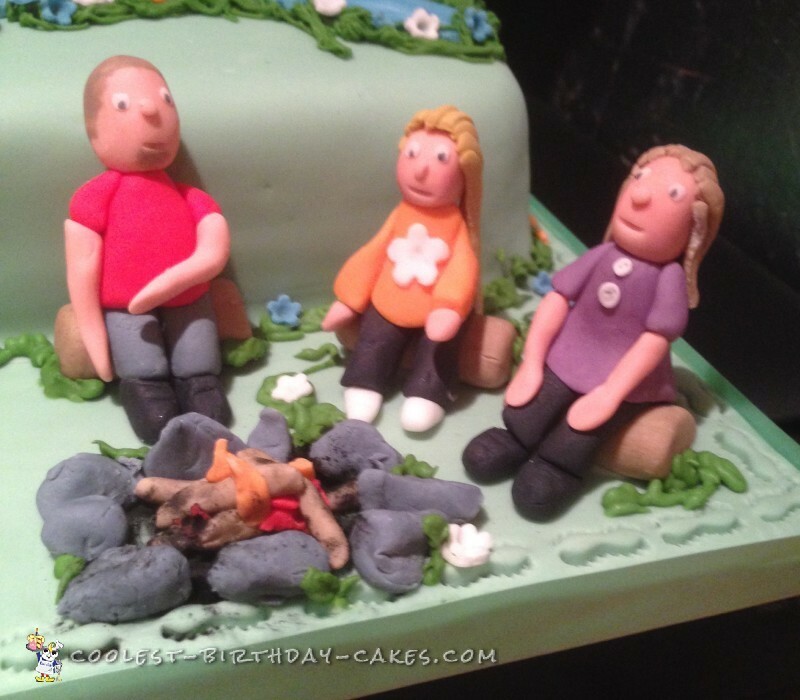 I baked 2x A4 sized cakes and a 4″round cake for the hill. When these were chilled, I filled them with jam and buttercream. I placed the 4″ cake on top and cut it to form the hill. I then covered the whole cake in buttercream and placed in the freezer to chill. Meanwhile, I colored some fondant green and rolled this out big enough to cover the cake and the cake board. The next day I rolled out some blue fondant for the stream and attached it to the cake. I attached the caravan and the trees and made some stepping stones for the stream. 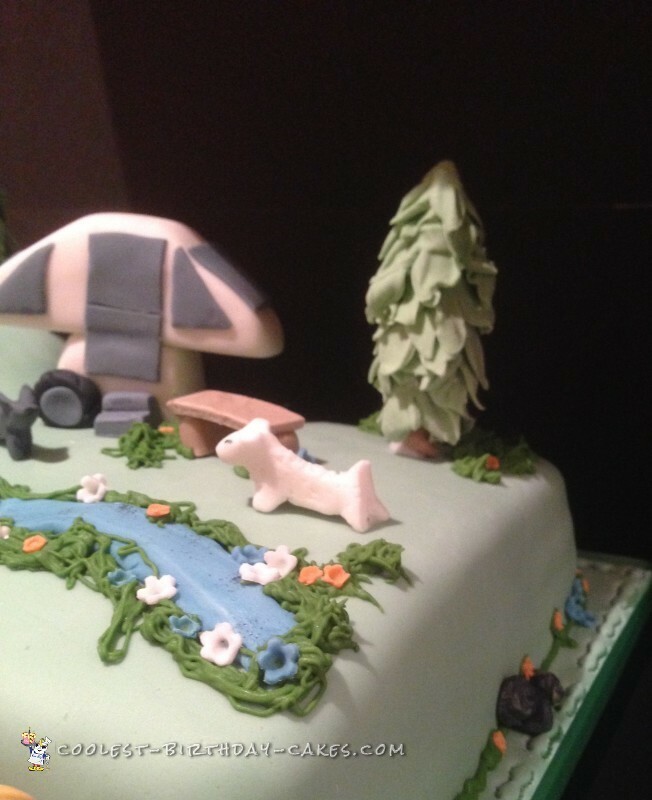 I piped grass around the base of the cake and along the stream with a grass piping tip and randomly attached flowers to it. I added the billboard and the people and then I made the fire and stones. The bench, two dogs and more stones got added next. I made a few more trees along the back edge of the cake, the number 40 and added cut out ‘Happy Birthday’ lettering to the cake board. The cake was finally finished.